The Moonflower effect has always been one of the most popular among mobile DJs because of its ease-of-use and colourful moving beams of light that help create atmosphere at any type of party or venue. ADJ’s new Monster Beam offers thicker beams of colour thanks to a higher capacity LED engine than any other ADJ Moonflower to date. In fact, this fixture boasts 25-Watts of LED output, creating what ADJ call ‘monstrously’ thick beams, which can be used with or without fog. The fixture’s beam angle is an impressive 29&#8304; and easily covers a large area with bright chunky beams of powerful colour cutting through smoke or haze. If fog is not allowed, the Monster Beam’s large bright dot patterns may still be projected onto the wall, ceiling or dance-floor of a venue. Not only is it brighter, but it’s more colourful too; the Monster Beam is illuminated by 25 LEDs: five red, green, blue, white, and also amber. Each LED is rated at a powerful 1-Watt and all LEDs are rated at a 50,000 hour lifespan. The Monster Beam’s thick, high output multi-coloured beams are equally matched by the fixture’s built-in programs. All the user need do is plug the unit in and set it to Sound Active mode, the Monster Beam will then deliver worry-free, pure lighting effects so DJs can focus on the music and their customers. 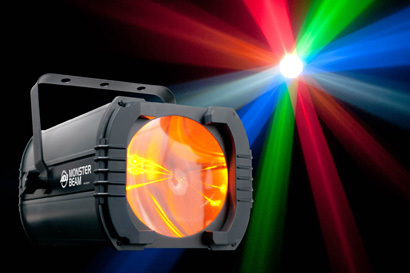 Along with a Sound Active mode, the Monster Beam may also be operated in DMX mode. Alternatively, users can connect multiple units together and they will all fulfil the same purpose in Master/Slave mode. Furthermore, the ADJ UC3 controller (sold separately) offers extra control and the fixture operation can also be easily controlled via the Monster Beam’s digital display and 4-button user menu. DMX In/Out link-ability and IEC In/Out power connectors allow users to daisy-chain up to twelve units at 230V, as the maximum power draw is a low 40-Watts. On top of being easy to use, the Monster Beam is practical too. A hanging bracket allows users to attach the unit to truss or pipes and it also features a safety loop to attach a safety cable. Weighing in at 3.3 kg and with dimensions of 15.5 x 10 x 8.25”, the Monster Beam is lightweight and portable, making it agreeable to the needs of mobile DJs and entertainers.